Merry Christmas, everyone! While we’re all busy sating our hunger for figgy pudding and other seasonal delicacies, we thought we’d bring your attention to a seasonal product from a few years back: the Twelve Days of Onyx condition cards. Ho! Ho! Ho! We had so much fun creating the Overly Specific Condition Cards and a special Condition Card for Halloween, we decided we wanted to try something new. These Twelve Days of Onyx Condition Cards are holiday themed Conditions selected from contest entries submitted by members of our creative and awesome community. It was really, really difficult to choose our 12 favorites from so many awesome submissions, yet that was the task and here are the ones our Onyx Path team chose. 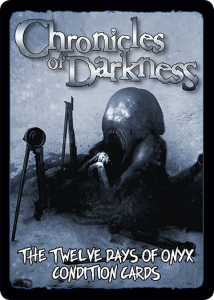 Part of the Chronicles of Darkness rules, Conditions add an additional layer of consequence and reward to certain actions in Chronicles of Darkness games. Various things within the course of a game can cause Conditions. These include exceptional successes, supernatural abilities, and really any situation where the Storyteller thinks they can be used to heighten the drama of a game.